"New Orleans is a city full of activity and celebration all the time, and Lambeth House is a delightful place to be" – M.G. If you are from Louisiana—or if you’ve only visited New Orleans—you know how lively, colorful, diverse and thrilling life here can be. Lambeth House is conveniently located in the city’s Upper Audubon neighborhood, close to many of the area’s finest amenities. See our map for an overview of our location. Explore the links below to get a taste of our local lifestyle, including our residents’ favorite destinations. Audubon Park is one of the region’s finest outdoor resources, and it’s only steps away from Lambeth House! Designed by John Charles Olmsted, the architect of Central Park, Audubon Park is located on the present-day site where the World’s Industrial and Cotton Centennial Exposition was held in 1884. The park features a paved 1.68-mile loop path under a gorgeous canopy of 100 year-old oak trees, great for morning walks punctuated with views of ponds, migrating birds and the Audubon Golf Course. Audubon Park Golf Course. 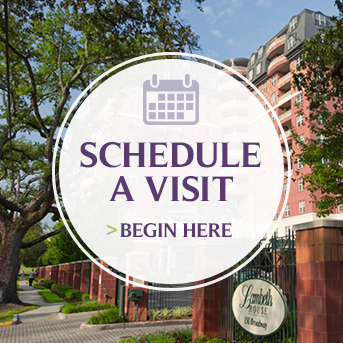 Also just steps away from Lambeth House, the Audubon Course is set within Audubon Park. Rated one of the top public courses in America. Eighteen holes over 5,739 yards with a par of 68. Audubon Zoo. Across Magazine St. from Audubon Park, Audubon Zoo offers an exotic mix of animals from around the globe, as well as the award-winning Louisiana Swamp and Jaguar Jungle. Audubon Zoo is consistently ranked among the top zoos in the country! New Orleans Golf Courses. Link to all golf courses in the New Orleans area. New Orleans Saints – the 2010 NFL Superbowl Champs play at The Louisiana Superdome. Tulane University – Green Wave Athletics: NCAA football, baseball, and more! New Orleans Museum of Art. Situated within City Park, the museum is New Orleans’ oldest fine arts institution. The museum includes the magnificent Sydney and Walda Besthoff Sculpture Garden – home to a large number of world-class sculptures. WWII Museum. The National WWII Museum is the only museum in the United States that addresses all of the amphibious invasions or "D-Days" of World War II, honoring the more than 16 million Americans who took part in this global conflict. Louisiana Philharmonic Orchestra. More evidence for New Orleans’ designation as Travel + Leisure Magazine’s #1 music city in America! A full schedule of fine performances – September through May. Friends of Music. A stellar series of chamber concerts at Tulane University’s Dixon Hall, including quartets, trios, duos, and solo piano. Tulane Summer Lyric Theatre. A high quality musical theatre, based on the campus of Tulane University. New Orleans Ballet Association. A dynamic season of dance, featuring a variety of world-class companies. New Orleans Opera Association. The 2010/2011 season will feature productions of The Gershwin's Porgy and Bess, Mozart's The Magic Flute, Bizet's The Pearl Fishers, and Verdi's Il Trovatore. The Ogden Museum of Southern Art. The world’s largest collection of Southern Art. Prytania Theatre. The oldest operating moving theatre in New Orleans, Prytania Theatre opened in 1915, and it’s the only Single-Screen theatre in Louisiana. French Quarter. Oldest neighborhood in New Orleans and a spellbinding part of town. Mardi Gras. The population of New Orleans more than doubles with visitors around this time of year. Commander’s Palace. A quintessential New Orleans dining experience – in the Garden District. Farmer's Market. Just a stone's throw from Lambeth House, the Tuesday Crescent City Farmer's Market offers delicious gourmet treats, plus fresh, local and affordable fruits, veggies, seafood and more! Langenstein’s (local grocer). Uptown’s best supermarket, since 1922! Magazine Street. A dining and shopping haven, only a short distance from Lambeth House and St. Charles Avenue. Here, you’ll find a variety of shops, galleries, and bistros, it’s both charming and stylish. Maple Street Café. An intimate, Uptown-neighborhood bistro offering a unique mix of Mediterranean, Italian and French fare. Perlis Clothing Store. A favorite men’s and women’s clothing retailer on Magazine St.
Loyola University. Private Jesuit university ranked as the fifth best institution among Southern regional universities offering masters and undergraduate degrees. Tulane University. Private research university that includes Tulane University School of Medicine, the 15th oldest medical school in the United States, well known for its innovative approach. nola.com. Get the latest New Orleans information, local news, weather updates, and sports news from The Times-Picayune official website. The New Orleans Advocate. Offering online news, and New Orleans only printed daily newspaper. Citysearch. Find reviews and ratings of New Orleans hotels, shopping, events, and more. Guide to the City. Things to see and do in New Orleans.